Deadly riots at South African mine Jump to media player A reporter in Pretoria told 5 live Up All Night why platinum miners from rival unions started a riot in South Africa. 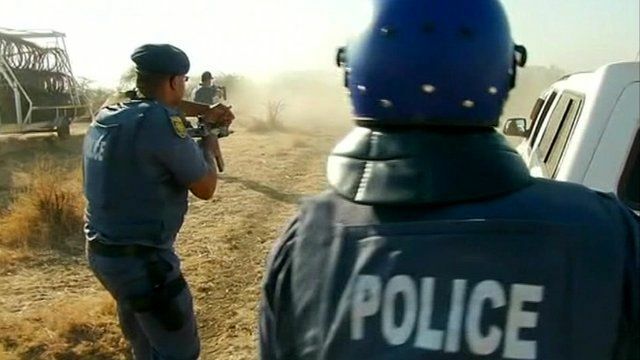 There has been outrage in South Africa after riot police opened fire on striking miners, leaving at least 30 people dead. It happened at the Lonmin Marikana platinum mine, around 60 miles from Johannesburg, following a week of violent protests. The incident has evoked uncomfortable comparisons to the actions of the police during the years of apartheid. Caroline Hawley's report contains disturbing images.